SALE – Now 33% Off! See Cart For Price! These Copag Playing Cards are made of 100% Plastic. The Elite, Master, and Export Designs are professional quality playing cards and are used in leading casinos and card rooms. Two-deck sets are available in red and blue, burgundy and green, or black and gold. Copag offers these back designs in either Narrow (Bridge) Size (2-1/4" x 3-1/2") or Wide (Poker) Size (2-1/2" x 3-7/16"). Elite, Master, and Export Line Copag designs are available with either regular or jumbo index (super index) numbers and pips. 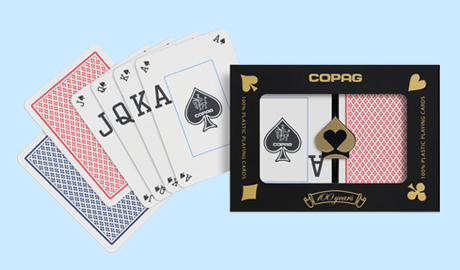 Copag's Silver Line offers 100% plastic playing cards in six unique, contemporary designs, available in Bridge size (2-1/4 x 3-1/2) with numbers and pips in super index. Copag's Four Suits Design, made of 100% plastic, comes in a two-deck black and red set in Bridge size (2-1/4 x 3-1/2) with numbers and pips in super index. 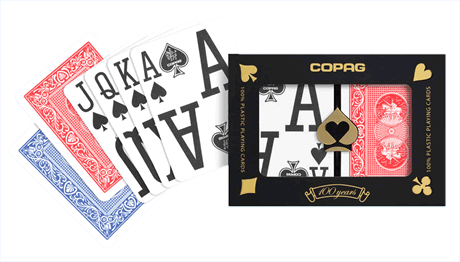 For additional information on large volume pricing for Copag Plastic Playing Cards, please contact us at 1-800-233-0828.